This photograph taken Wednesday, Aug. 29, 2018, in downtown Reno, Nev., shows one of the weekly motels that increasingly are becoming the last stop before homelessness for hundreds of working families who can't afford to live anyplace else. An economic boom spurred by the arrival of thousands of new employees at Tesla, Google, Apple and other corporate giants has created an unprecedented housing crisis in the area. (AP Photo/Scott Sonner). Reno, Nev. • They were the toast of Reno in the 1950s, when the growing casino industry sparked a boom that for a time turned northern Nevada into the West’s top gambling destination. Dozens of downtown motor lodges provided spare but comfortable retreats for motorists who took to the nation’s new highways to see the bright lights of the self-proclaimed “Biggest Little City in the World” and try their luck at the slot machines and blackjack tables. Today, the lodges still standing are in disrepair and rent rooms by the week. But there is one similarity to their heyday: Reno is booming again and so are the lodges — just not with vacationers or fortune-seekers. They have become the housing of last resort for Reno’s down-and-out, a population that has soared in recent years as red-hot housing and rental markets have priced out more and more people. California is partly to blame. Silicon Valley firms from Apple to Tesla have set up operations in the Reno area, bringing waves of well-paid tech and manufacturing workers. At the same time, California’s soaring home prices and rents have sent thousands of people across the state line looking for more affordable housing. Four of every 10 people who will move to Nevada this year will be from California, and most of those arriving in Reno and its suburbs are from the San Francisco Bay Area. Along with that human stampede have come rising home prices and rents — as well as rising anxiety for those living on the margins. He and his partner pay $850 a month for a small studio in the Fireside Inn, cooking food they get at a pantry on a small portable skillet they place next to the bathroom sink. Both are thankful they are no longer on the streets but say many of their neighbors are senior citizens or the disabled who are on fixed incomes and just one rent increase away from homelessness. An estimated 4,000 people — mostly working-class families, seniors and the disabled — live in the pay-by-the-week motels. For many, the lodges are the last stop before being forced onto the streets or to live in their cars. The growing number of homeless in and around Reno is among the most visible effects of the area’s recent population surge, bringing to Nevada a crisis that has been plaguing California and other West Coast states for years. Reno’s homeless shelters are overflowing, and local police periodically clear makeshift homeless camps from the banks of the Truckee River, which flows through downtown. They’re places Wendy Wiglesworth doesn’t want to return to. Last year, she finally was able to save enough money for an apartment after years of being homeless. 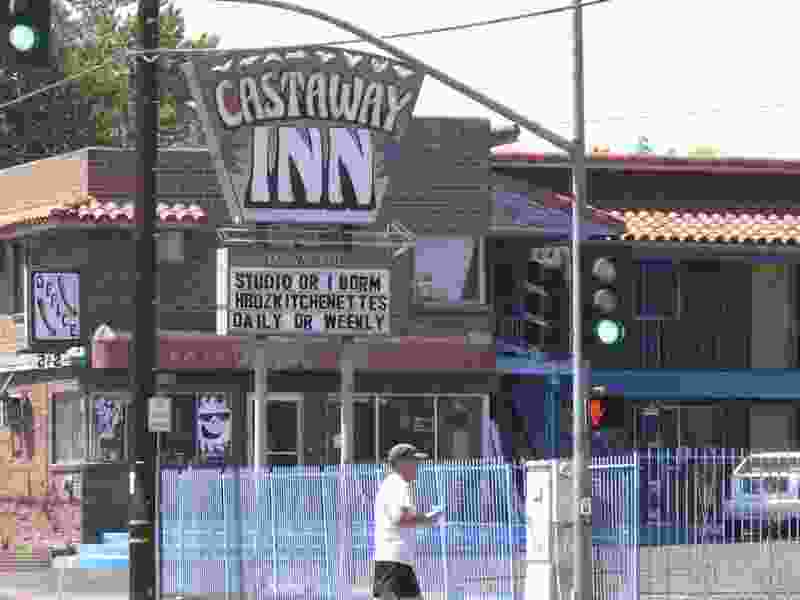 A few months later, she got bad news: The building was being sold to developers who wanted to tear it down to make way for student housing near the University of Nevada. She ended up at one of the old motor lodges, which typically rent for about $800 a month — $500 less than rent for the average two-bedroom apartment. Its owners have so far refused similar purchase offers, but Wiglesworth said she lives in constant fear that could change. Last year, 27 indigent people, identified by service groups as homeless, died in Washoe County. That’s a statistic that is personal for Aria Overli, an organizer with the community group ACTIONN. A few years ago, her sister moved into her apartment after being evicted from her own place. Rising medical bills left her unable to afford rent. Last March, she took her own life. Civic groups such as ACTIONN, local elected representatives and interfaith clergy toured several of the motor lodges over the summer, hoping to create a strategy to address Reno’s housing problem. “We were not ready for such robust growth rates and are in many ways still not recovered from the downturn,” she said, identifying housing and homelessness as the most pressing issues facing the city. The National Low Income Housing Coalition ranks Nevada last among all states for providing affordable housing for its poorest families. Over the past year, the Reno City Council expanded homeless shelter capacity, beefed up inspections of the weekly motels and budgeted $1 million to identify the most promising housing ideas. The city and county have used federal block grants to build 342 affordable housing units over the past year and have another 1,200 under review or being built. Creating a special fund dedicated to making affordable housing more widespread is another potential strategy, but one that will require approval by the state Legislature. A main supporter of that approach is Eric Novak, president of Reno-based Praxis Consulting Group, which helps various groups finance affordable housing projects.